Orang-Utan (in malay "man of the forest") are protected under the Fauna Conservation Ordinance which, among other things, prohibits hunting, trading or keeping them as pets. 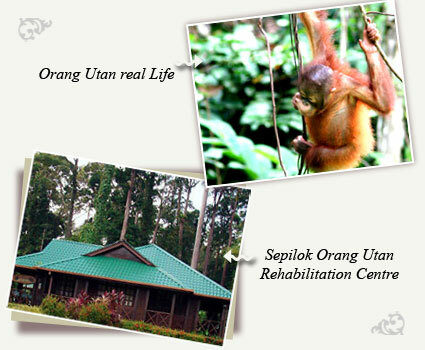 The Sepilok Orang Utan Rehabilitation Centre was established in 1964 to return orphaned apes back to the wild. The centre was being administered by the wildlife section of the Forestry Department which in 1988 was upgraded as a department under the Ministry of Tourism and Environmental Development. All administration and management was given to the new Wildlife Department of Sabah. The objectives of the project have expanded in recent years. While Orangutan rehabilitation is still the primary goal at Sepilok, present aims include public education on consevation, research and assistance to other endangered species such as captive breeding of the rare and endangered rhinoceros. This centre is now under the supervision of more than 37 staff, including a Wildlife Officer who is also officer-in-charge of the centre, a veterinary doctor, wildlife rangers and general workers. The centre has a reception centre, information centre, offices for wildlife staff, an animal clinic, quarantine area and enclosures for various animals such as the rhinoceros. epilok, renowned for its orangutan rehabilitation project, has stimulated a greater local and international awareness of the protection laws for endangered species, and the Centre has resulted in an increase in detection and confiscation of illegally held captive animals.